Ralph Lauren goes back to basics with this Wooten Tote from its affordable Lauren diffusion line. The Wooten's a very classic tote, but Ralph Lauren's put its own spin on the design. The saddle-shaped leather trim nods to Ralph Lauren's iconic equestrian motifs, and the bold orange color is lots of fun. The Wooten looks like a practical bag, but it really leaves us wanting. Just a single slip pocket really isn't enough to keep such a spacious handbag organized. It's bound to become a black hole for small items, no matter how hard you try to eliminate clutter. The zippered closure and long leather straps are nice touches, but they still can't make amends for that half-baked interior. The Wooten is affordable for a bag with designer pedigree at $98, but its functional failings still make me pause. It might have a big name attached, but its styling is so unremarkable you'll easily find something that looks similar with many more features. It's disappointing to see Ralph Lauren attaching his esteemed name to a tote so lackluster. The Longchamp Le Pliage Expandable Travel tote bag, a great alternative to this nylon bag. Designer handbags are hot property in the world of auctions. Leading auction houses say luxury leathergoods is a new and rapidly expanding category attracting attention from buyers and sellers around the world. Matt Rubinger, the director of luxury accessories at Heritage Auctions says that he's noticed "incredible growth and interest from the average consumer in that type of piece" in the last five years. His Dallas-based auction house has capitalized on the interest since launching its first dedicated handbag auction in the December of 2010. In last year's sale it sold a red crocodile Hermes Birkin for a world auction record $203, 150. In the same auction a blue crocodile Birkin fetched $113, 525, a figure that also broke the previous record. It might seem insane to spend five and six-figure sums on fashion goods, but Rubinger insists the bags hold or increase their values over time. Not that you'd easily part with them! As you might expect, globally revered auction house Christie's is also keen to get in on the act. In November it will stage its own handbag auction to offload 70 Hermes bags and vintage Chanel, Lanvin, and Louis Vuitton creations. The key to the interest in these high-end accessories lies in their quality and craftsmanship. Auctions tend to offer limited edition and one-of-a-kind hand-crafted pieces that allow fans to skip the waiting lists new goods attract. Have you ever participated in a handbag auction? New England handbag firm Brahmin has been enlisted to create the official Fashion's Night Out tote for the third consecutive year. The latest Fashion's Night Out tote was designed in collaboration with the event's organized. This year's limited edition bag is crafted from canvas offset with genuine leather. Its distinctive lettering design is available in two unique color palettes. Brahmin's chief marketing officer Jimm Bunn said his firm was thrilled to pair up with the fashion event for the third time. "Brahmin is proud to display our commitment to the fashion industry and its most iconic celebration by producing the official FNO tote," he added. As with the past Fashion's Night Out handbags, a portion of the proceeds will benefit the NYC AIDS Fund in the NY Community Trust. The choice of charity is fitting as the now-global Fashion's Night Out celebrations began in New York City. 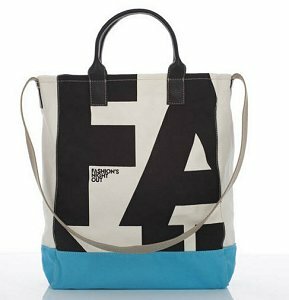 The Fashion's Night Out tote will be sold at Brahmin stores, including its online outlet, and participating Fashion's Night Out retailers including Bergdorf Goodman, Bloomingdales, Lord & Taylor, Nieman Marcus, Saks 5th Avenue, and Lord & Taylor. For $50, they're an affordable way to commemorate the annual fashion event and raise money for a good cause. I was never a fan of Coach's loud patchwork and monogrammed bags, but lately the label's discovered a new classic aesthetic. With bags like the Alexandra, Coach is proving it's still a fashion label to be reckoned with. Rather than relying on fashion forward flash, Coach opts for traditional elegance. Its clean lines and minimalist design is modern, but its pebbled black leather and lack of accents ensure it won't date. The embellishment-free exterior also helps the Alexandra work its way into any situation. It'd make a smart office purse, but not look out of place during happy hour. Every detail on the Alexandra is there to work for us. The zippered exterior pocket is ideal for stashing those items you need on hand. There are more pockets inside the main compartment, which is spacious but not excessively so. The Alexandra's dual straps are long enough for over the shoulder carrying during summer, but they won't work with the bulk of a winter coat. Thankfully Coach has also offered a detachable strap to use once cold weather rolls around. At $398, the Alexandra is very affordable for a high quality bag that promises to become part of our everyday wardrobe. The shell pink Coach Alexandra bag, a great alternative to this black bag. Michael Kors serves up refined summer style with this elegant Marina Shoulder Bag. Its name is the perfect moniker, as I can just imagine swanning about the coast carrying this bold bright white bag. White leather always makes such an impression, at least before those inevitable age marks creep in! The delicate perforations give the skin an on trend, athletic appeal. I can't say that I'm a real fan of the drawstring closure on a practical level. It's fiddly to use, and we'll find ourselves relying more on the magnetic snap for security anyway. 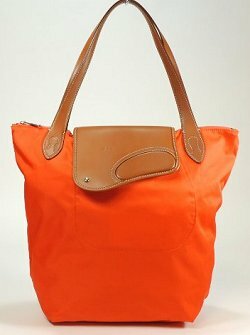 But it does give the Marina an appealing slouchy shape which is perfect for everyday wear. This closure sees the leather pleating gently, further emphasizing its quality. The drawstring's a bit of an inconvenience, but its aesthetic appeal almost makes it seem worth the effort. The Marina is generously sized, almost tempting us to fill it with summer goodies like flip flops and swimsuits. There's no space for a towel, but you could probably slip that over your shoulder if you're planning on an after-work swim. I also really like the removable pouch that's tucked away inside. It's quite simple and unlined, but it'll work well as a coin purse or even a basic clutch. The Marina has a real warm weather appeal, but worn with the right outfit I imagine it'd work during winter too. If you can manage to slot it into your wardrobe all year round you'll see real value for your $259.99. 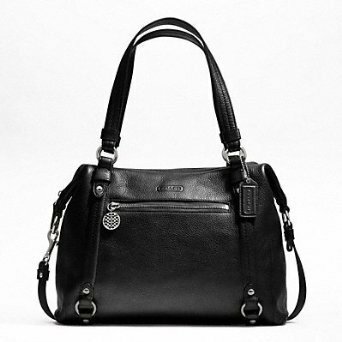 The black Michael Kors Marina bag, a great alternative to this white bag. New York federal court judge Harold Baer dismissed the $450 million case launched by disgruntled former employees Flor Duarte and Wenyu Lu. Lawyers for the pair are refusing to comment on the case. 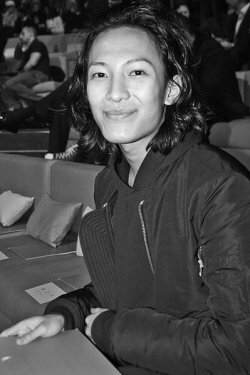 A spokesperson for Alexander Wang has been more forthcoming, commenting that all at the company "are gratified that this matter has been dismissed, as the allegations were unfounded and completely false." The dismissal should be a weight off Wang's shoulders, but he hasn't escaped entirely scot-free. 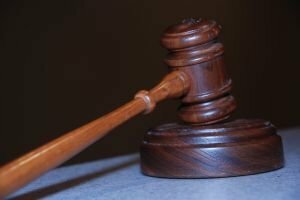 Apparently the court's decision to reject the case only came about after an "undisclosed settlement" was reached between both parties. The groups reportedly requested that the case be dismissed with prejudice, so we'll never see this nasty mess in the courts again. Thank goodness for that! It's disappointing that Wang needed to cough up cash to make the claims he's always denied go away. I suppose when you enjoy his profile though, getting on with it may be more important than fighting for principles. Now that this case is behind him, he can start clearing up his images and doing what he does best! It might have a stuffy name, but this Governor's Lodge Hobo from Ralph Lauren's Lauren label is a real head turner. Champagne is usually a gentle metallic, but there's nothing subtle about this color. That might appeal to a certain section of the population, but I'm less than enthusiastic about it. It really seems incongruous, as the Governor's Lodge has such a sensible design. It'd look so classic if it were made from a neutral leather rather than this glitzy skin. Peeking inside the Governor's Lodge we really see its potential. It's a good size for everyday use, and it's got just the right amount of pockets for easy organization. The front pocket is perfeect for holding small essentials like keys and lip gloss, while the zippered one on the back affords us a bit more space. The single handle is long enough for over-the-shoulder carrying, and as its flat it shouldn't slip when you're on the move. At just $248, the Governor's Lodge hobo is really affordable for a well-made leather purse. It's just a shame its color makes it far less versatile than it should be. 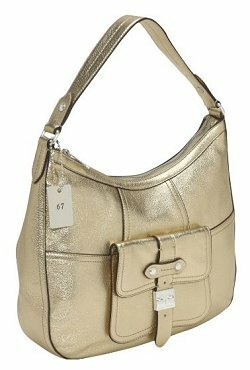 The red Ralph Lauren Governor's Lodge hobo bag, a great alternative to this champagne bag. 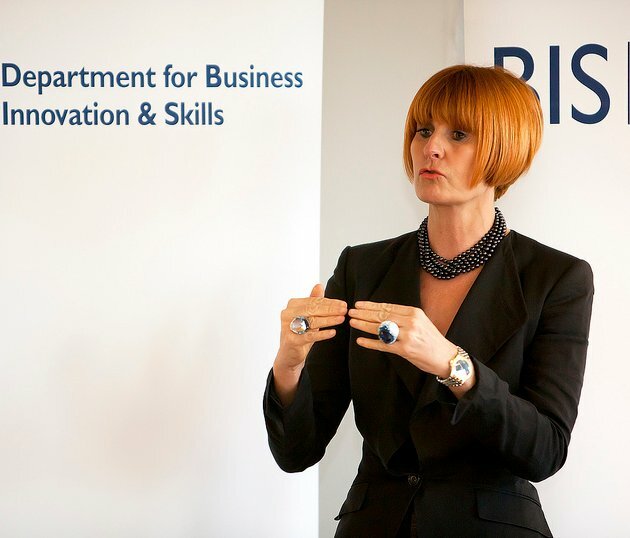 Department store chain House of Fraser is clearly enjoying collaborating with British businesswoman Mary Portas. The team is planning to add accessories to its fashion line this fall. The six new handbags will sit alongside Mary Portas' womenswear line for House of Fraser. The apparel items claimed to be "fashion for grown-ups," and Portas assures fans this same maturity will continue through the accessories line. "We sat down to design our Mary handbag collection with the same intention as when we launched the new clothing range a year ago," she explained. "That is, we wanted to create bags that look totally chic, feel gorgeously luxurious, and multitask like nobody's business at a fair and reasonable price." The handbag collection is small but comprehensive, with designs ranging from large shopping bags to petite clutch purses. Each one shares its name with a musical genre. The Mary Portas handbags are affordably priced between ₤39 and ₤189 to appeal to House of Fraser's loyal clientele. The Mary Portas purses will launch in ten House of Fraser stores across the United Kingdom, including the six House of Fraser Mary Portas concept stores. The concept store on London’s Oxford Street will also put its new Accessories Room to good use with a dedicated Mary Accessories boutique. Ed Hardy tones down its usual blinged-up aesthetic for this casual Edna Tote. Of course nothing from the Ed Hardy stable could be a wallflower. Its familiar Love Kills Slowly tattoo art is emblazoned across the tan canvas, but in sky blue the print is quite subtle. The golden splotches also bring Ed Hardy's characteristic flash without taking the design over the edge. The large front pocket hints at the Edna's practical nature. 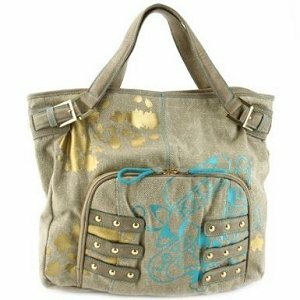 In fact, the Edna may be one of the most functional bag's Ed Hardy’s created. The canvas body will age much better than the synthetic it usually employs. Its manageable mid-sized dimensions are complemented by a selection of zip and slip pockets. The handles are long enough to sling over your shoulder without appearing disproportionate. I'm impressed by the Edna, but not impressed enough to spend $205 on it. There are so many canvas bags that cost far less on the market. It seems even Amazon knows that, as it's currently slashed the price by a whopping 80%. If you can find it on a similar sale, then you'll certainly see value. The black Ed Hardy Edna tote bag, a great alternative to this tan bag. French bank Société Générale looks to appeal to the country's women with its new Pour Elle card. The program offers members up to $250 of theft insurance for their handbags as well as two complimentary calls to electricians, locksmiths, and other common tradesman. Société Générale says "Those who choose these cards are those who wish to adhere to their femininity." However critics of the program suggest it's simply sexist. It seems ladies don't like their banks telling them about femininity, or handbag care. The idea that losing a handbag or blowing a fuse are "female crises" is also pretty patronising. After all, plenty of white collar men have next to no idea about home maintenance either. And if we want to talk about real female crises, domestic violence, unemployment, and famine are probably bigger fish. Société Générale is taking the criticism in its stride and insisting it sees nothing "discriminatory" about its new program. After all, while the scheme's tailored for women the bank insists that 5% of its cardholders are men! And with our handbags ever more expensive, perhaps insurance isn't such a crazy idea. Do you think the criticism of Société Générale is justified, or do you think its new Pour Elle scheme is a smart idea?